Pick Analysis: The Saints continue to address their woeful secondary with the selection of Jenkins. As a versatile defender with outstanding cover skills, Jenkins fills a huge need at corner or safety. Though the team signed Darren Sharper in the offseason, Jenkins could eventually supplant the former Pro Bowler as the team’s starting free safety. Jenkins is regarded as the best Big Ten Conference defensive back since Michigan’s Charles Woodson terrorized league quarterbacks and receivers en route to capturing the Heisman Trophy in 1997. The similarities in their game is what most impresses pro scouts, as both are known for their physicality in playing the bump-and-run, along with the ability to make game-changing plays. The comparisons between the two continue, as most experts also envision Jenkins moving to free safety in the professional ranks, a position Woodson was moved to midseason last year with the Green Bay Packers. Jenkins, the three-time All-Big Ten Conference choice, usually plays on the wide side of the field, but often moves around the field to cover the opponent’s best receiver. Called a natural pass defender with great instincts and outstanding speed and quickness, Jenkins excels at man-to-man coverage. He tied the school career record by returning two of his 11 career interceptions for touchdowns and has also used his excellent leaping ability as a standout special team performer, having blocked three kicks during his career. In 49 games for the Buckeyes, he has never allowed a touchdown reception. At Piscataway High School, Jenkins led his team to three consecutive state titles. The All-State and All-American choice played receiver and defensive back. He also excelled at track, winning the state title in the 400-meter dash as a junior. He took third place in the 200 meters as a junior and finished third in the hurdles as a senior at the state meet. Most freshmen spend their first year residing on special teams at Ohio State, but Jenkins appeared in 10 games at nickel back, starting three games at that position and three more at boundary cornerback late in the season. He suffered a knee sprain that sidelined him for the final two regular-season contests, but he returned to play in the Fiesta Bowl vs. Notre Dame. He produced 37 tackles (23 solos), broke up two passes and returned an onside kick 34 yards as a 180-pounder. Having bulked up during the offseason, Jenkins took over field cornerback duties in 2006, starting all 13 games. The All-Big Ten Conference first-team pick led the OSU secondary with 55 tackles (40 solos) that included 4.5 stops behind the line of scrimmage. He broke up four passes and intercepted four others, returning one 61 yards for a score in the Penn State clash. He also blocked one punt. Jenkins was a Thorpe Award (nation’s top defensive back) semifinalist as a junior. He added All-American and All-Big Ten Conference honors, as he shifted to boundary cornerback, starting all 13 contests. He produced 44 tackles (27 solo) and five stops behind the line of scrimmage. Teams refused to throw to his side of the field, as the opposition completed just 32.3 percent of passes thrown into his area. He intercepted four passes, as he returned one for a score and knocked down three other throws. The team captain was a unanimous All-Big Ten choice and consensus All-American in 2008. He captured the Jim Thorpe Award and was a semifinalist for Bednarik Award (top defensive player in the nation). He shifted back to field cornerback, taking on the top receiver each game, as he totaled 57 tackles (34 solos) and caused three fumbles. He added three pass thefts, nine pass deflections and had four stops for loss. He also continued to excel on special teams, blocking two more punts. The opposition averaged just 3.83 yards on 60 pass attempts into his territory. Attended Piscataway (N.J.) High School…Led his team to three consecutive state titles…The All-State and All-American choice played receiver and defensive back… Also excelled at track, winning the state title in the 400-meter dash as a junior…Took third place in the 200 meters as a junior and finished third in the hurdles as a senior at the state meet. 1	Sun, Sept. 13	vs. Detroit Lions	FOX	1 p.m.
2	Sun, Sept. 20	at Philadelphia Eagles FOX	1 p.m.
3	Sun, Sept. 27	at Buffalo Bills	FOX	4:05 p.m.
4	Sun, Oct. 4	vs. New York Jets	CBS 4:05 p.m.
6	Sun, Oct. 18	vs. New York Giants	FOX	1 p.m.
7	Sun, Oct. 25	at Miami Dolphins	FOX	4:15 p.m.
8	Mon, Nov. 2	vs. Atlanta Falcons	ESPN	8:30 p.m.
9	Sun, Nov. 8	vs. Carolina Panthers FOX	4:05 p.m.
10	Sun, Nov. 15	at St. Louis Rams	FOX	1 p.m.
11	Sun, Nov. 22	at Tampa Bay Buccaneers	FOX	1 p.m.
12	Mon, Nov. 30	vs. New England Patriots	ESPN	8:30 p.m.
13	Sun, Dec. 6	at Washington Redskins	FOX	1 p.m.
14	Sun, Dec. 13	at Atlanta Falcons	FOX	1 p.m.
15	Sat, Dec. 19	vs. Dallas Cowboys	NFLN	8:20 p.m.
16	Sun, Dec. 27	vs. Tampa Bay Buccaneers	FOX	1 p.m.
17	Sun, Jan. 3	at Carolina Panthers	FOX	1 p.m. 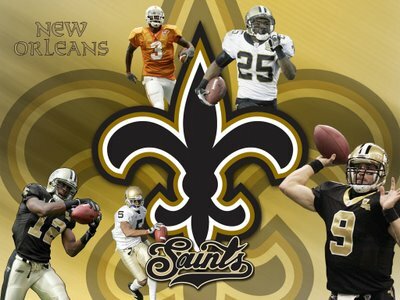 The 2008-2009 Saints’ season begins. I predict a 11-5 record along with a NFC South Championship. I hope that I’m right. Training Camp starts this week. Yeah!! !